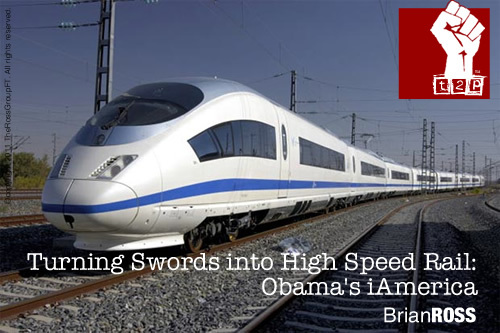 President Obama wants to bulk up high-speed rail, and scale down defense spending. FDR converted peace-time manufacturers into a dominating wartime production system. Why can’t President Obama make the bold move to convert our defense contractors into builders of our peacetime future? Right now, it looks like billions of dollars will be going to Japanese and European companies who will bid on, and get, high-speed rail projects. Some of the jobs laying track and building stations will go to Americans, but the large majority of the money will end up in foreign hands. On the other hand, we have defense contractors who develop state-of-the-art make-work projects to keep the billions of dollars flowing to develop next-generation weaponry, much of which is not always that necessary. It just keeps people back home in those congressional districts employed. Could not a General Electric, or a Boeing, or a Lockheed Martin, or a General Motors, leverage their advanced technologies to deliver a new next-generation, state-of-the-art, 300mph train that blows the barn-doors off of what is out there currently? Why can’t Detroit rethink the whole premise of transit, and revisit 20th century dogma about highways and cars with 21st century technologies that blend solutions. Just as we moved away from the box-car and the warehouse to the multi-purpose freight container that moves from ship to shore to truck to store, why can’t we re-engineer and rethink our transportation situation? This is where I have to fault President Obama. It is not enough to say that we need to go there. Just as he called out intransigent Republicans today, he has to show equal boldness and challenge the transportation, automotive, and defense industries to turn their skills to collectively rethinking the engines of our economy that get people and smaller amounts of goods and services from point A to point B. President Kennedy, FDR, and even Ronald Reagan have used the bully pulpit to challenge American industrialists to push the envelope, to not only meet challenges from abroad but set the bar that much higher, and bring thousands and thousands of jobs that actually MAKE something back to America. “We’re building the future of high speed rail today, and I would like to say that I’m proud to announce that the billions of dollars that will be spent on such a worthwhile project will be spent on American companies. The companies that have become the leaders in the world today in that market are from Japan and Europe. We will not turn away, in a fair and free bidding process, the current state of the art, but I challenge our industrial giants. If Boeing and General Dynamics and Lockeed Martin and can build state of the art submarines and aircraft, why can’t they bring the lessons learned from generations of building warcraft to build the next generation of American transportation? General Electric and General Motors have extensive experience in freight rail systems. Why can’t they turn their attention to billions in profit building our peace-time infrastructure? FDR was able to use crisis, depression, and war to rebuild the country’s pride and purpose, as much as provide jobs and defend the world from the threat of totalitarians like the Nazis, the Italian fascists and the Japanese. President Obama has to rearrange the Federal spending map. A freeze is not enough. If we continue to build up our armed forces to be the world’s policemen, we will spend 3% or more of our GDP where most of the rest of the world coasts on far less, especially the Japanese. We pay for most of the world’s security. We could easily cut back to just 2% of GDP and fund most or all of the domestic agenda of the Obama Administration. That won’t happen, though, until we can find a way to co-opt the defense establishment, which can lobby with their billions to insure that their pipelines of federal dollars will keep generously flowing. The genius of repurposing industry, as FDR did during WWII, and as Obama should do now, is that it really doesn’t matter to Boeing or General Dynamics whether they build aircraft or fleets of high speed trains. General Motors can make a lot of money designing new vehicles that fit into a larger, more well-thought out road and rail grid that uses out-of-the-box thinking like the changes in the container shipping world to deliver better transportation to commuters. A train that loads up a new kind of commuter automobile that can easily be placed on to high-speed rail cars, moving hundreds of vehicles at high speeds to destination points where they are quickly loaded and off-loaded, leaving commuters with a way not to rely on limited and poorly built bus mass-transit which scares away all but the most desperate or the most green of commuters. It may sound far-fetched, but then again, so did an iPhone back in the 1960s. The nay-sayers said that these things could not happen either. Yet here we are, because the visionaries of the world will trump those mired in their own doubts uncertainty and fears. John F. Kennedy challenged us to go to the moon. The least that Barack H. Obama can do is challenge us to get between Cincinnati, Toledo and Cleveland in an hour or less a leg. The American imagination and spirit are not dead. They have been channeled into a virtual world of video games and movies that stretch out into the realms of the possible and impossible without cost or risk. What happens when we turn our mighty higher educational systems to the problem of educating and inspiring the new Henry Fords and Thomas Edisons and Steve Jobs? They are out there, to be found in our America in the 21st century. We can find ways to encourage them, to nurture their audacious ideas and seemingly crazy dreams. In turn they will improve our world, and reshape our reality much as the visionaries of the early 20th century did. We used to trumpet our innovation. Now we openly mock it. CNBC pundits often joke or lament that we are a country that builds or does nothing, and point to a dim future where we continue to create more services, not goods. I think that is a mistake. We can make new and better things. The private sector, Ronald Reagan land, will never make it happen. Perpetuating the status quo allows people to make money without too much vision or effort. Microsoft is an embodiment of that kind of greed and mediocrity, always imitating the inventors and capitalizing on it through control of the marketplace, not of a superior product. It is that malaise that has plagued America into expecting less for decades. Governments, and leaders with vision have always lead the way in the creation of the worlds greatest innovations, from the Panama Canal to the Internet, because they have the power to change the playing field and redefine it for the common good. President Obama needs to create iAmerica, where the “i” stands for invention and ingenuity. They are the cogs of progress that churn out the bedrock of this century’s future jobs and prosperity. This entry was posted on January 29, 2010 by Brian Ross in 2010, Barack Obama, Big Three Auto Makers, Corporatocracy, Democrats, High Speed Rail, Internet, Politics, Republicans, Technology and tagged American Ingenuity, Aviation/Aerospace, Boeing, Capitalism, Chrysler, Civil Projects, Defense Budget, Defense Spending, Entrepreneurship, Environment, Fdr, Franklin Delano Roosevelt, General Dynamics, General Electric, General Motors, Government, Green Business, Green Living, Green Technology, Henry Ford, High Speed Rail, High Speed Rail Projects, Inventing, Living News, Military, Political Opinion, Politics, Politics News, President Obama, Public Works Projects, Rail, Steve Jobs, Technology, Thomas Edison.